Update: Empower Malawi is currently working on finishing the construction of the Earthship Community Center and to create a much needed pre-school for the community of Kapita. This is currently underway, check back soon for updates! In January 2015, Biotecture Planet Earth, in collaboration with Earthship Biotecture, returned to Malawi to continue building an Earthship Community Center for a remote village in rural Malawi. 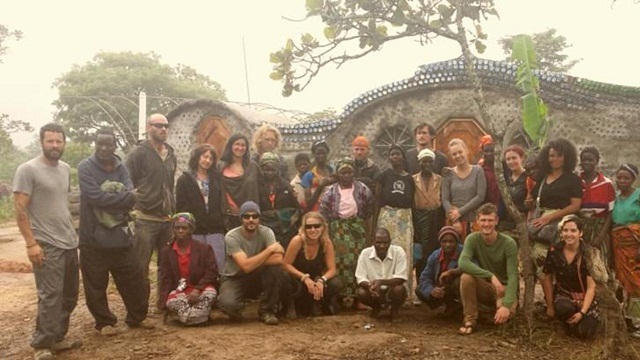 This is the second time that the Earthship crew went to this very remote community in Malawi with a group of volunteers to build an Earthship Community Center; an 8 room building made out of tires, cans and bottles that is resistant to natural disasters, catches and stores rainwater, and provides the community with much needed shelter and space for a bank, a womens’ center, a library, toilets and showers. During this second hit, work was done on four rooms to add on to the two rooms that were already completed and materials were left behind for these four additional rooms to be finished by the local crew. One more toilet was also added. There was an important amount of technology and knowledge transfer between the crew, volunteers, and 35 local workers who worked on the building and will complete the construction between May and December 2015. Challenges included the remoteness of the area and the extreme weather conditions – Malawi was facing its worst rainy season in thirty years, creating devastation in the Southern part of the country and heavy rainfall in South-West Mzimba, the area where the project took place. Some of the cement work will have to wait to be completed by the local volunteers once the rainy season ceases in April/May 2015. > The 9 volunteers who joined us on this 12 day life-changing project. > The donors that made it possible for this project to happen. Thank you for supporting this project from far away. > Biotecture Planet Earth and Earthship Biotecture crew for their support and sacrifices to see this project go ahead. > The near 40 local volunteers who helped put this building together and who studied and learned with us. > Empower, the local organization that helped organize this project from the beginning. It is now in Empower’s capable hands to organize and complete this building. The Kapita Community Center is completely self-sufficient and incorporates all Earthship principles: it uses thermal mass to keep a cool temperature, it collects its own power from the sun, it treats its own sewage on site, it produces a significant amount of food and most importantly, provides the community with a rain water catchment system which filters and provides drinking water. Biotecture Planet Earth is continuously supporting this project so the local people of Kapita, Malawi, are able to finish this building.